Roberto received a degree in Clinical Psychology at the University of Padua and a PhD in Anthropology and Epistemology of Complexity at the University of Bergamo. 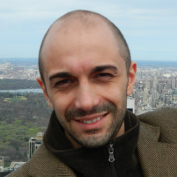 Before joining SISSA, he worked as a post-doctoral fellow at the New School for Social Research in New York, University of Milano-Bicocca and the Center for Mind/Brain Sciences in Trento. His main interests are language processing and evolution, consciousness, abstract thinking and cognitive neuroscience of blindness. Currently, he conducts his research in the context of a joint project between SISSA and the Center for Mind/Brain Sciences (CIMeC). In this research project they study conscious and unconscious semantic processing in sighted and blind people.